1 Normal Summoned/Set monster Cannot be Link Summoned, except during Main Phase 2. Clara & Rushka, the Ventriloduo wraps up the week and I will apologize for picking this card, I did it only because of the tremendous artwork. The card isn’t useful at all. You can only Link Summon it in the Main Phase 2, it has 0 ATK, and the arrow points to your opponent. A Normal Summon or Set is useful, but slower compared to the spam Special Summons to Link Summon style, if you could set a monster, then use that set monster to Link Summon this it would be better (being the only monster in the game able to do so), but your set monster has to be flipped. Maybe you Normal Summon something like Reborn Tengu, make this card, get another Tengu, make a Rank 2, get your third Tengu, potential Rank 3 or other Special Summon options utilizing your graveyard. I’d be very surprised if someone somehow made this card useful. High Quality Artwork, Low Quality Card. 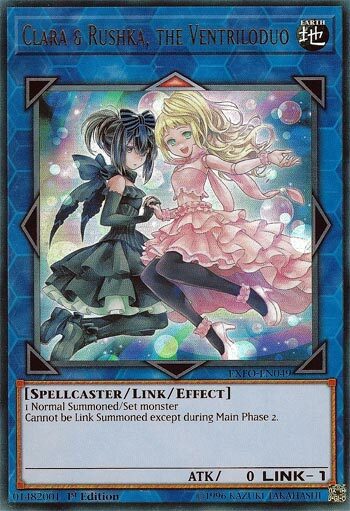 Clara & Rushka, the Ventriloduo is a Link 1 Earth Spellcaster-type Link Monster with 0 Atk and one top Arrow. It can only be Link Summoned during Main Phase 2 and only with a Normal Summoned or Set Monster. That’s awful. Just look at the card and forget everything else. Hang it on the wall, but don’t put it in any deck. Score: 1/5 Art: 4.5/5 Only losing points because of the name. I don’t get or see Ventriloduo. We end the week looking at an odd Link Monster from Extreme Force: Clara & Rushka, the Ventriloduo. Clara & Rushka is a Link-1 Earth Spellcaster with 0 ATK and an arrow pointing Up. ATK is terrible, arrow is terrible considering the effect doesn’t help with this, type and attribute might be the only thing this has going for it. The summoning requirements is 1 Normal Summoned/Set monster. Before you say anything, if you Set a monster, it must be Flipped before it can be used as Link Material, as you cannot use face-down monsters as Link Material. All this card does it say you cannot Link Summon this during the Main Phase 2. I am sorry, but I don’t see the point of this card really. Maybe Ningrisu, but there are better ways of summoning that. It is a very niche card that will probably only be used to summon Link Monsters that require Link Monsters to summon, and even then I believe there will be better ways of summoning those types of Link Monsters. It has nice art, but doesn’t help the rating at all. I just don’t see a good use for this that isn’t very niche, but I will be kind and let those niche uses bump this card a little higher than the lowest score possible.